Earlier this month, we told you that some benchmark tests were indicating that there was a major difference in battery life between an Apple iPhone 6s powered by the TSMC version of the A9 chip, and the same model handset using the Samsung built A9. 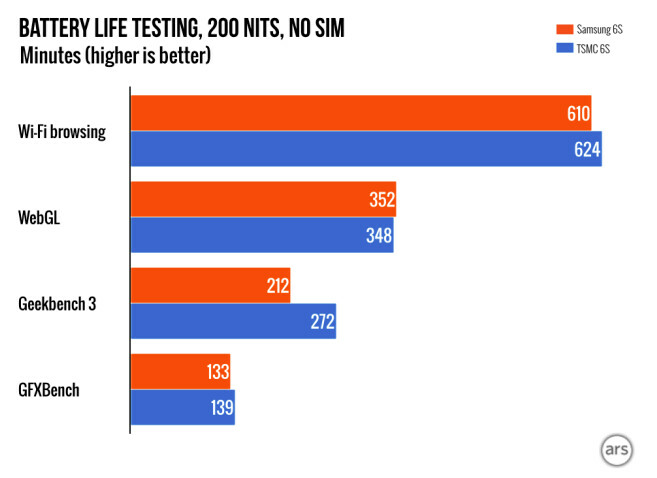 One benchmark test showed that the TSMC A9 was getting nearly 2 hours more of battery life. In the real world, an iPhone 6s with the TSMC chip was getting more battery life, although not as much as the benchmark tests showed. And Apple issued a statement that said that the actual variation could be 2% to 3%, which would be within the range tolerated by the manufacturer. 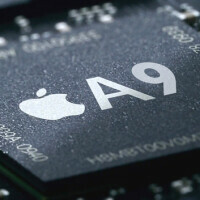 New benchmark tests conducted today by Ars Technica do show that the TSMC built A9 offers a slight advantage in battery life, just as Apple has been saying. In a test to measure battery life while browsing on Wi-Fi, an iPhone 6s stuffed with Samsung's chip provided only 2.2% fewer minutes of battery power. On GFXBench, the difference was 4.3%, again in favor of TSMC. Testing the battery using WebGL, the phone with the Samsung chip outscored one with the TSMC A9, but only by 1%. The one unusual result took place on Geekbench. Testing the battery on that benchmark site, the TSMC powered iPhone 6s outscored the iPhone 6s powered by Sammy's A9 by 28%. According to Ars Technica, as long as Samsung's chip is idling, or not struggling with a heavy CPU or GPU load, the battery life will be within the 2% to 3% variance that Apple mentioned. But once the processing units are hit with some heavy duty tasks, the Samsung chip will consume more battery life than the TSMC A9, by more than the 2% to 3% that Apple says is okay. That explains the huge difference with the Geekbench test. Keep in mind that every effort was made to have the settings on both phones match. But some components inside the phones have multiple sources other than the SoC. Each test was run twice, and the results were averaged. We've already explained how you can determine whether your iPhone 6s is using an A9 built by TSMC, or employing an A9 produced by Samsung. Thankfully, I'm rocking that TSMC baby! I've been able to kill my battery twice, since having it, and both times were on purpose. The 6S Plus has outta this world battery life. We have an iPad and the standby time is great, but I'm wondering if that's because it's a tablet and not a phone.. how is the standby time on the iPhone? Is there a big difference in standby times between an iPhone and an Android phone? In my standby time tests, between my 6S Plus, and Note 5 it went like this. Charged both phones to 100%, and took them both off the charger at 8pm, when I went to bed. I woke up at 3am, my normal sleep wake times. that's 7 hrs. In that time, with all apps closed, the iphone was at 99%, and the Note 5 89%. I turned off do not disturb also, to get a more realistic result. At work, from 4am-12:15pm on the days the Note stayed on, but in standby, it got down to 71-73%. When the iphone stayed in standby, it finished the work day at 91-96%, both phones receive more notifications during the day. Being outside in the heat could also factor in. It simply has had the better battery life, based on my testing, standby, and daily usage. As I type this it sits at 52%, after being off the charger since 2:30am pct. it's 3:26pm pct now. This is with heavy usage. Apples power management for iOS 9, is absolutely great. On the days my Note does all the heavy work, it gets to about 50-52% after 8+ hrs, the iphone gets to about 75-79%. I always take screenshots of the results. I know the Note does more, and I've turned off all the gestures I don't use, set location to GPS only, wifi to not always scanning for networks, ect, but the iphone still beats it. Lillipop flopped. Get the fact straight. And Marshmallow will as well. Face it. Wow, I didn't know you could predict the future. Yeah, right. Always the same crap from you BobbyBuster. BTW Apple and its die hard sheep are trying to point the blame on others for Apples choice of using ridiculously small battery. So what better way then to shift the smell of $hit away from yourself, then to point the finger at another. Apple dwvices have bewn known to gominto a deep sleep when not used for long periods of time. ANDROID devices never do this. Didnt you know this? wow, so Android is that bad? can't go to deep sleep when not used is too dumb. Not a good thing to have. I love Apples power management in iOS 9. Yep! Always connected. Those widgets need to update. Wow pretty cool, thanks for the personal experience. I've always had a nudge that the iPhone would have a great standby time after seeing our iPad's performance. I know with any of my family's android phones (mostly older Samsung flagships), the standby time isn't so impressive.. at all, ha. I am not surprised with the Note 5's standby battery draining either.. sounds exactly like my Note II. While I feel like I cannot live without the S-Pen at the moment, battery life is one of the most important things for me when it comes to flagship smartphones. I'm curious to see how the Marshmallow update will help, but I must say I was quite impressed with the iPhone 6S/6S Plus this year and a bit disappointed with the Note 5. I read on another tech site that the iPhone 6S and 6S Plus displays have some kind of anti finger print coating on it, but I didn't see that mentioned anywhere else so it must have been bogus(?!). If they were to add an anti fingerprint or anti germ display, I'd totally be in to try an iPhone. I know it has the normal anti smudge coating, that never works lol. The battery life is awesome, I've only been able to kill it twice, both times on a Saturday, when I'm off. My wife had class and I had nothing to do, so I hammered the phones, and put em to the test. Other than that, the 6S Plus never taps out. My Note will tap around 5-6pm. Ah, that must have been it. I hope flagship companies work on making those become the standard because I'd hate to wipe my phone every time I use it. I say the iPhone 6S Plus is a very solid phone this year. I may recommend it to my family who finds the iPad UI (iOS) enjoyable and easy to use. Yeah, Apple came strong this year. Much more stable to software wise. Yikes, my Z3C finishes a 8-hour night with 1-2% gone...you must have apps going crazy on that note 5. Then again, I have 3C toolbox shutting down app permissions and controlling startup events on pesky apps like Google play services, Web browsers, etc. No Facebook, instagram, or any other constantly polling app. Hate those things! No, the iphone just gets better battery life for me. I do, and the 2K screen on my Note 5. Im not a little close minded fanboy like you, I enjoy variety. So we should expect the TSMC equipped iPhones will carry a higher resale value. Yeah I know it shouldn't but people will start demanding TSMC equipment iPhones, watch. The dude who wrote that article at Arstechnica is a 200% Apple fanboy. What does that have to do with the price of mangoes in Indonesia? It's iPhone to iPhone testing, using an Apple-designed SoC, so whether he is a fanboy or not has nothing to do with it. I'm sure he is pretty much like everyone who uses an IPhone, and Apple themselves, in that he doesn't care one bit about Samsung and what they are doing. All depends on real world usage baby.